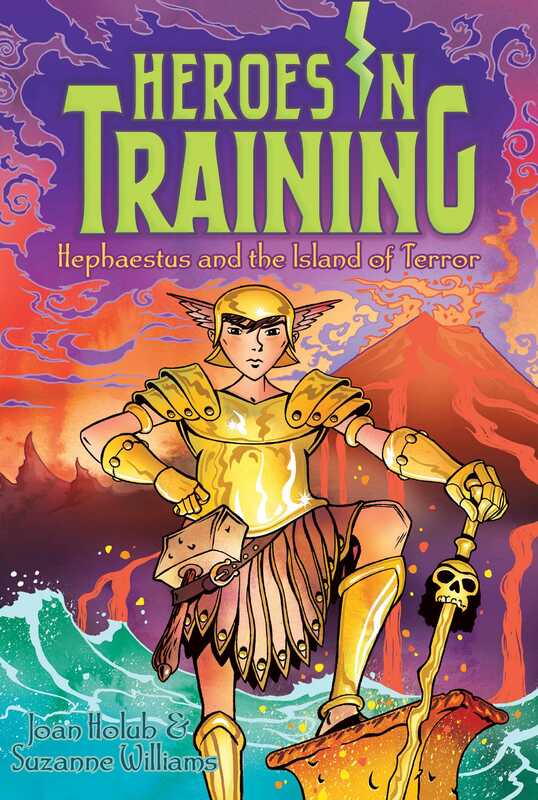 Zeus and the Olympians might find a new leader among metal-working warriors in this Heroes in Training adventure. Fresh off their adventure with Crius’s Cronies, the Olympians set out for the island of Lemnos, and there’s a reason they receive warnings as they travel: Warriors holding intricate weapons greet them as soon as they come ashore! Then they meet Hephaestus, the leader of the island who they quickly realize is actually one of them—the Olympian they were meant to find. CHAPTER ONE Wake Up Already! Early morning sunlight filtered through the trees as the ten most wanted outlaws in Greece ran along a wooded path. They were on a quest, heading for the coast of the Aegean Sea. And they knew that any minute the enormously tall King Cronus—the evil leader of the Titans—might pop up and attack them. His entire Crony army was searching for them, to take them prisoner. Why? Because they were Olympian gods and goddesses! And even though they were all just human-size ten-year-olds, Cronus knew that these immortals would do anything to stop his dastardly plans to take over the world. Zeus, a blue-eyed, dark-haired boy, stayed just ahead of the other nine immortals. As he ran, a worried expression on his face, he kept tabs on their surroundings. Since he was the leader of this bunch, he was always concerned for their safety. Keeping pace with him was his brother Poseidon, who shared the same dark hair but had eyes the turquoise color of the sea that he ruled. And behind them, the rest of the gang jogged along. There were three other boys—Ares, Apollo, and Hades. And five girls in all—Artemis, Athena, Demeter, Hera, and Hestia. “The goats are angry. Quick! Get the fig jam!” Artemis mumbled. She was their weak link. She stumbled along at the back of the line, her sleepy eyes half-closed. Her twin brother, Apollo, held her arm, guiding her. When blond-haired Hera turned to stare, Apollo shook his head in dismay. “She keeps talking in her sleep. Her dreams and thoughts must run very deep!” he explained, talking in singsong rhyme-speak as usual. “Well, she’s slowing us down,” Hera said. She sounded a bit breathless from jogging along the rocky forest path. “And the sooner we reach the coast, the closer we’ll be to the island,” said Hestia. “I know, but—” Hera began. Pythia, the Oracle of Delphi, had been sending them on quests ever since Zeus had learned that he was an Olympian and not just a mortal boy. A prophecy foretold that the Olympians would overthrow King Cronus and the evil Titans someday. However, Pythia kept saying they weren’t ready for that yet. Each of them needed to find their own magical object or weapon first, and there were still more Olympians to find too. From beside Zeus, Poseidon looked back at the sleeping Artemis. She was falling farther and farther behind despite Apollo’s support. “Stop the chickens!” she said, flapping her arms like wings. “Maybe another squirt of water?” Poseidon suggested, lifting the trident he held. It looked like a pitchfork but was magical and could shoot water from the ends of its three pointy prongs. “What rhymes with ‘you and your rhymes are annoying’?” Hera asked him huffily. Apollo appeared to consider this. Rhymes were his specialty, especially the ones in songs. He was a talented musician. He could sing and also play the lyre, a stringed instrument that he carried slung across his back. “Well . . . ,” he started to say. Hera rolled her eyes. “Never mind,” she muttered. “Hold up,” Athena hissed. Everyone came to a dead stop, panting as she pointed to a footprint in the dirt. “It’s so big that it has to have been made by a Crony,” she said. Though not as enormous as King Cronus, the Cronies were way bigger than the Olympians. In fact, they were as tall as trees! Nodding, Hera pulled her magical object, a peacock feather, from her belt. It was green and had blue and orange markings on the end that looked like an eye, so it was called the Feather of Eyes. She was right, thought Zeus. He would never say so to Hera, but her rhyme had kind of stunk. It had taken her a long time to find her feather, and she was quite proud of it. However, it would only follow commands spoken in rhyme. And though she might think otherwise, she didn’t have the skill that Apollo did when it came to rhyming. Still, the feather obeyed her now and floated off. Apollo grinned at Hera. “You know, I could help you with your rhyming if you want,” he offered. She glared at him and his sister. Before she could lash out at Apollo, Hestia piped up. “When your feather comes back, maybe you could tickle Artemis all the way awake,” she suggested to Hera. “Or I could try growing a remedy for her.” Demeter, the goddess of the harvest, touched the magical packet of seeds that hung from her belt. “That’ll take too long,” Athena put in. “True,” said Demeter. “And it would be better to save the seeds for crops if we can.” Just one of her magic seeds could grow enough food to feed a whole village. So she used them carefully, not wanting to waste them. Hera giggled. “Sorry, but fighting lines and dolls doesn’t sound scary at all compared to the battles we’ve faced on our other quests.” In the past the Olympians had fought off some terrifying monsters—a three-headed dog, bird women with razor-sharp claws, weird warriors who hopped around on one foot—and more. “Or even ninety percent,” quipped Poseidon. “Hide!” said Zeus, running for cover. “Aw, come on. It’s just one Crony. We can take him! Anyone up for a fight?” asked Ares, waving his spear. He was the god of war and was always eager for battle.